After four weeks in Central America, we are going to be embarking on a journey north of the 64th parallel, We are heading to explore Finland! A Finland winter has plenty of extreme activities, some of which are done nowhere else in the world. The Finnish Sauna is not just a “popular thing to do” in Finland, it is a part of the national culture. We had to try it! When we arrived we found doggies, doggies and more doggies! It wasn’t just a Finland dog sledding adventure, it’s a family affair. If there is something that we really don’t want to do, we just don’t do it. Yet we still jumped in a frozen Finland lake for ice swimming! Finland cross country skiing is a very popular athletic activity and a way of life. But for us it was more like cross country plodding. We still loved it! We went rapids floating in Finland. What a good dose of cold fun! One week is hardly enough time to spend getting to know an entire country. It’s a teaser really but we managed to get a few snapshots of Finnish culture. Take a look at some of our favourite Finland photography turned into postcards. With Pete in Helsinki, Dalene enjoyed the Aland Islands on her own, and found the trip to be a perfect match for her. Here are a few choice highlights from Helsinki, including some gushing over the most beautiful bench in the world. Learn how to do winter the right way and travel to Kemi, Finland. Who let Dalene drive? We took three snowmobile trips in Lapland, and she tipped the machine in one of them. We spent an overnight excursion dog sledding in Lapland that felt like we were undertaking a grand expedition, as intended. Our winter activities in Tampere took us out of the city more than in it, but we learned they are really one and the same. Our few days in Saimaa, Finland confirmed that our favourite thing about Finland are the people within. One of Finland’s greatest natural resources is the vast open spaces and pure silence that accompanies them. 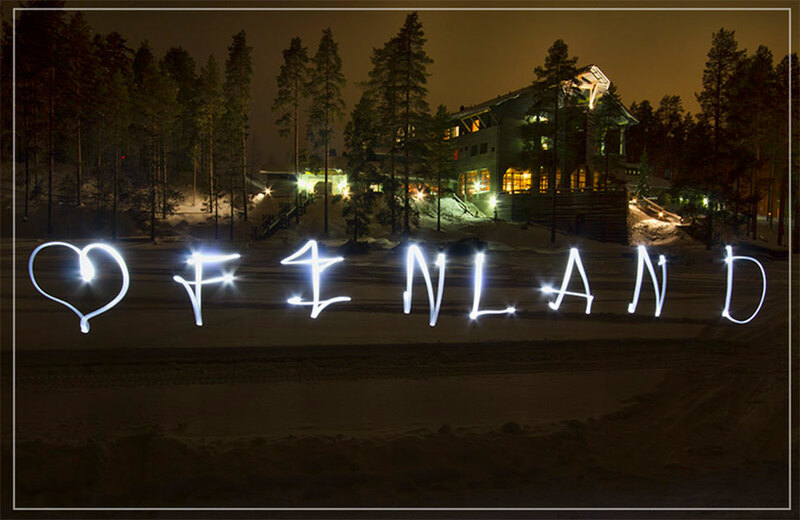 Check out our postcards from Finland we created from our second-trip.